To serve it’s European (and global) customers better, Amazon Germany has an English version of its online store since March 2016. In the meanwhile most pages and menus have been translated in several other European languages with a large customer base that do not have their own local Amazon website: Dutch, Polish and Turkish. Serving its customers in their own language allows Amazon to further remove barriers to expand it’s business in the European market. Below we explain how to use Amazon.de in English and the same tips apply to those who prefer the Dutch, Polish or Turkish version. How to switch to the English version of Amazon.de? You have successfully changed your default language for browsing, shopping and receiving communications from Amazon.de to “English”. 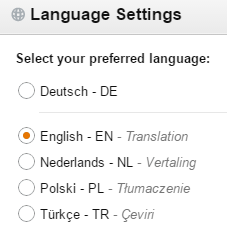 If you wish to change your default language, you may visit Change Language Settings at Amazon.de. Is everything translated to English on Amazon.de? Most pages and menu’s are translated. This allows you to find easily your way around on Amazon.de. Product descriptions are however often still in German. This is in particular the case for products only sold on Amazon marketplace (sold by third party vendors). Amazon works continuously on improving translated content and the availability of the site in English has triggered foreign suppliers (from the UK or US for example) to sell their products to the European mainland through Amazon Germany. And what about customer service? Does it also exist in English? Yes! You can now communicate any issues with your orders through you English account pages. You also have the choice to be contacted via email or via phone with the Amazon.de customer service in English. If you choose for contact via phone, Amazon will propose you to be called by a customer service agent for free. This works very well and service is excellent as we are used to from Amazon. Once you are switched to English as explained above, you can contact customer service directly via deze link. Do you have any other questions or do you want to share your own tips for Amazon Germany? No Delivery to your country?